The works of this husband and wife team are certain to surprise and delight the viewer. 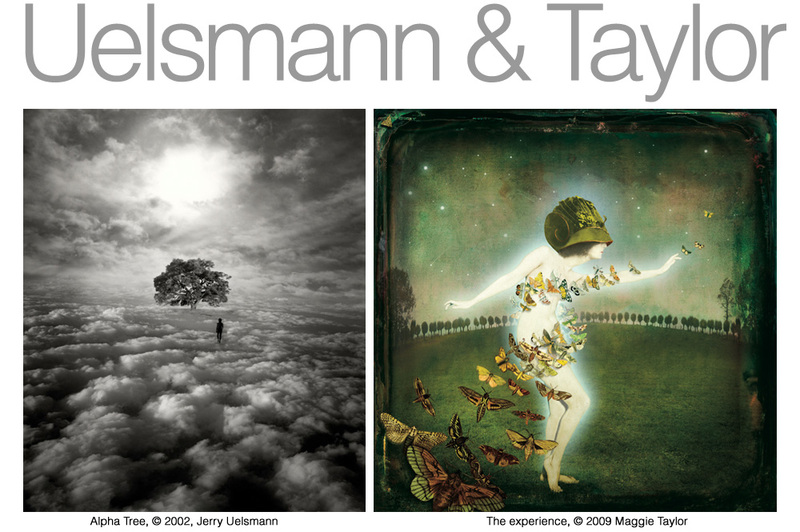 Jerry Uelsmann began his career in the 1960s and was one of the first photographers to have a one-man show at the Museum of Modern Art in New York. That show helped establish photography as genuine art form and not a strictly technical process. His work is in a class of its own, with wildly imaginative black & white montages of disparate images. The casual viewer might assume his work was done with Photoshop, but this couldn’t be further from the truth; it’s all done with a series of photographic enlargers, sandwiched negatives, and multiple exposures. Maggie Taylor’s work is equally imaginative, but is diametrically opposed to her husband’s techniques. She works exclusively with digital techniques, using antique photographs and found images – all in glorious color. Viewed together, their works are a delightful combination of old and new, digital and traditional – and 100% inspiring and delightful. Click here for an article about the artists in Nashville Arts Magazine.